Good. The jewel case shows normal wear. The CD shows very minor wear if any at all. All item shipped Monday-Friday, fast shipping from New Hampshire! Very Good in original case. Gently used; disc(s) is/are clean. Pasadena's finest new and used independent bookstore since 1992. Christmas Traditional; Felix Mendelssohn; Graham Ross; Gregorian Chant; Herbert Howells; Johann Sebastian Bach; John Rutter;... Fine. In fine packaging. 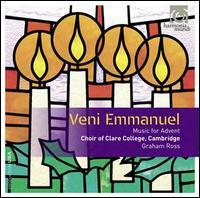 The Choir of Clare College Cambridge-Veni Emmanuel: Music for Advent by The Choir of Clare College Cambridge. Christmas Traditional; Felix Mendelssohn; Graham Ross; Gregorian Chant; Herbert Howells; Johann Sebastian Bach; John Rutter;... New.